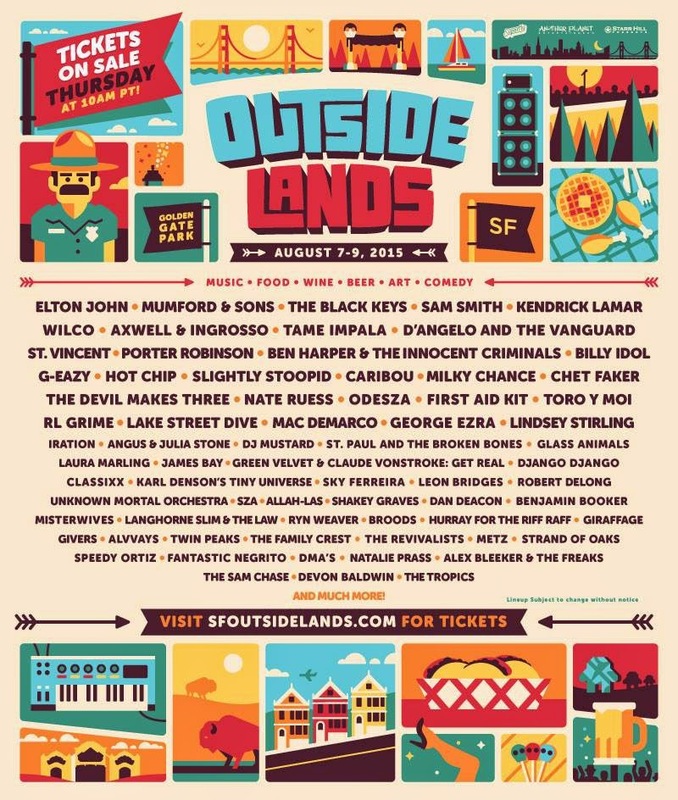 This morning at 10am, Outside Lands dropped their 2015 lineup announcement 2 weeks earlier than ever before!! This August 7-9 will be the 8th Outside Lands Music and Arts Festival since the festival 's 2008 inception. Outside Lands 2015 will also be MY 8th year attending the fest in Golden Gate Park! I already purchased my Eager Beaver pass on March 12th in order to maintain my perfect attendance record :) I'm SO excited to see Elton John, Kendrick Lamar, Robert DeLong, D'Angelo, Billy Idol & Shakey Graves all for my 1st time! Ben Harper & The Innocent Criminals - Some of the 1st live shows I ever attended in life were Ben Harper & Dave Matthews Band shows. I can't wait to see Ben again!! Leon Bridges - I'm seeing Leon for my 1st time TONIGHT at Troubadour in West Hollywood! The show sold out in less than 30 seconds!